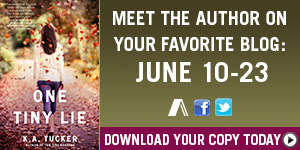 Magical Urban Fantasy Reads: One Tiny Lie Tour Stop Q&A and Giveaway! 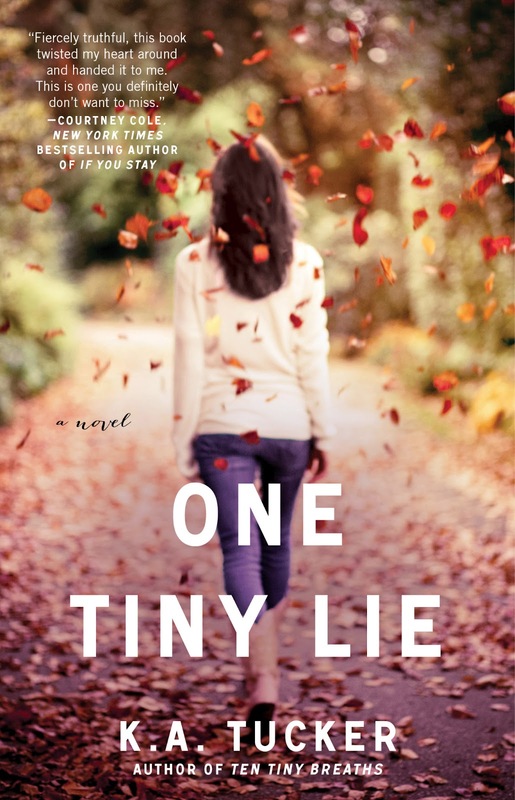 One Tiny Lie Tour Stop Q&A and Giveaway! Me: I'd like to welcome my absolute favorite author! She not only writes some amazing books, but she's also one of the coolest and funnest people I've met since I've started blogging and I hope that one day I'll be lucky enough to meet her in person. Hi K.A. Thank you so much for stopping by again! KA: Actually... yes, it is :-) I never want my readers bored. I want them on their toes at all time, wondering what's going to happen. And if they've already figured out what may happen (a lot of readers did early on, in Ten Tiny Breaths), I want them biting their nails with anxiety, waiting for the bomb to drop. Those are the kinds of stories I enjoy. KA: Actually... yes, again :D Part of developing the characters is figuring out where their boundaries are and then throwing in conflict that really tests them. Doing so creates multi-dimensional characters. Me: You first started out writing your YA series, with vampires and alternative universes, and now you’re writing a NA Contemporary. How was the writing different for you? And which genre was easier for you to write? KA: In my YA series, I have focused a lot of effort on worldbuilding and plot. That's critical in order for the reader to relate more to the story, given the elements they can't relate to (the paranormal aspects). I find it takes a lot of planning. The NA Contemporary book kind of just happened. I had an idea, I went with it, and the story flew together. There was much more focus on the character and her personal plight. Though the setting and plot are obviously important, it didn't take up as much of my time to develop. Easier to write? For me, jury's still out. I like to walk the line between reality and "oh my God! Can you imagine if that happened?!" That's harder to do in contemporary than in paranormal (for obvious reasons). But I find it is easier to write with emotion in NA contemp. Perhaps it's because I'm also writing in first person present. I HATED first person present until I read the Hunger Games. HATED it. Now? LOVE IT. Me: Ten Tiny Breaths was originally self-published, and then you signed with Atria. How did that happen and what was involved in the transition process? KA: I self-pubbed as I have with my other books and the book did very well. Publishers began contacting me, inquiring if I held the rights and if I had an agent... Over Christmas, I was contacted by my lovely agent, Stacey Donaghy, who had heard about me and TTB through a fellow writer. I signed with her after New Years and then everything kind of snowballed...I was contacted by an editor at Simon & Schuster, who expressed interest in TTB. My agent put the pitch together for four books and had it flowing out to the pub houses within a day or two. The offers came in and we decided to accept the one from Atria! Me: Did Ten Tiny Breaths change at all from the self-published version to the traditionally published version? KA: Very little. It went through another round of copy edits and we removed a few sentences (I'm talking four or five sentences). Otherwise, that's it! Me: Are you working on any other writing projects now, other than the two series you have already released? KA: I don't know how people can work on several books at once. I am not one of them! I find I have to focus on each story individually to get the characters right. Right now I'm writing the 3rd book in the NA series (Four Seconds to Lose). That needs to be wrapped up in about a month. 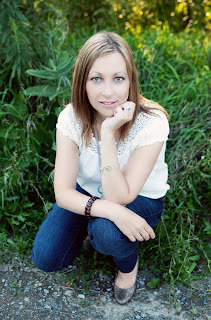 Then I'll put some real focus to Anomaly (the last book in my YA series). I have ideas floating around in my head but I have to get them on my screen. I hope to have that finished and out in the fall, however I have one last book due to Atria in November and that's a contractual deadline so I can't miss it. Me: Thank you so much for stopping by KA! I sure hope this won't be the last time! KA: Thank you for having me! I'm not going anywhere... are you getting rid of me? It's not easy. Honstly I really want to read it because I love the cover but I read ten tiny breaths and I loved that so this book is probably just as good!! She likes to torture us via her books???? "Part of developing the characters is figuring out where their boundaries are and then throwing in conflict that really tests them." I absolutely love Kathleen's story.